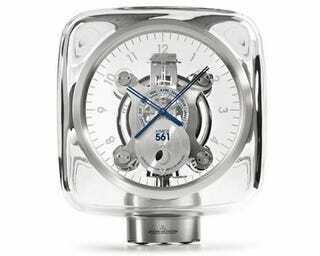 The Atmos 561 Clock, made by Jaeger LeCoultre and designed by Mark Newson, is powered entirely by changes in temperature and sits inside a block of crystal for good measure. According to The Watchismo Times, a change in temperature of one degree celsius can power the clock for two days. A mixture of Ethyl Chloride and "gas" is what reacts to the temperature change and expands against a spring in a chamber, which then converts its stored potential energy into clock power and so on and so forth. Though not a new technology, this update is easy on the eyes, and that has to count for something. For more shots of retro Atmos clocks, check out [The Watchismo Times via Technabob].